There are just certain movies that you watch throughout your life that you consider staples that everyone should watch. Some of these are generally universally considered "must-watch" films like Star Wars and Lord of the Rings; then we have our own individual list of movies that we feel all of our friends should see and are shocked when they say they haven't. Bill and Ted's Excellent Adventure is one of them. Now I'll be honest I hadn't thought about this film in years. It sort of sits in that weird part of people's brain where people remember it but don't talk about it much (like hopefully many of the selections for this type of blog post.) However on May 25th something happened to bring it front and center in my mind. 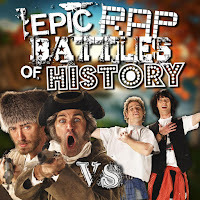 When the Epic Rap Battles of History released their Lewis and Clark VS Bill and Ted video, I did something I never do; I took a look at the comments section. There were tons of negative comments... although that was nothing new. Finding negative comments on a YouTube video is like finding an oxygen molecule on planet earth. However what did surprise me was the sheer number of people bashing the video because of the lack of knowledge about the characters portrayed. It doesn't really surprise me that people may not know much about Lewis and Clark with their exploration happening in 1804 and American's general lack of interest in history. But to not know Bill and Ted which only came out 26 years ago was baffling to me. I know there are a lot of kids out there watching YouTube but the sheer volume of people not knowing Bill and Ted was sad to me. Even my own wife said she'd never watched the film before; something I rectified within a couple days of learning. 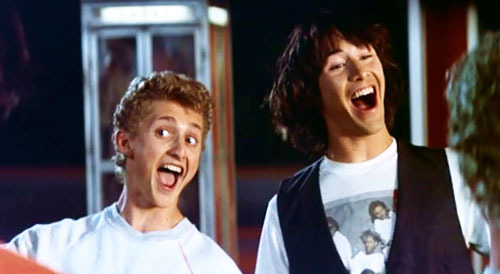 So let's talk about a movie that I never thought I'd have the need to talk about on here... Bill and Ted's Excellent Adventure. In the year 2688, humanity is living in an almost perfect society inspired by the music of "The Great Ones," Bill S. Preston, Esq, and Ted Theodore Logan from their band the Wyld Stallyns. A man named Rufus has been given the task of going back in time to San Dimas, California in 1988 by using a time machine disguised as a telephone booth to help Bill and Ted get an A+ on their final history oral report. The pair are absolutely dim-witted metal heads who have failed everything in history up to that point and anything short of an A+ would result them failing the class and failing the grade. If they fail, Ted's father is planning on sending him to military school in Alaska, breaking up the band and changing the future. 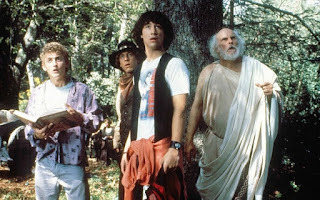 Bill and Ted meet Rufus for the first time outside of a Circle K convenience store where he attempts to tell them about the future. 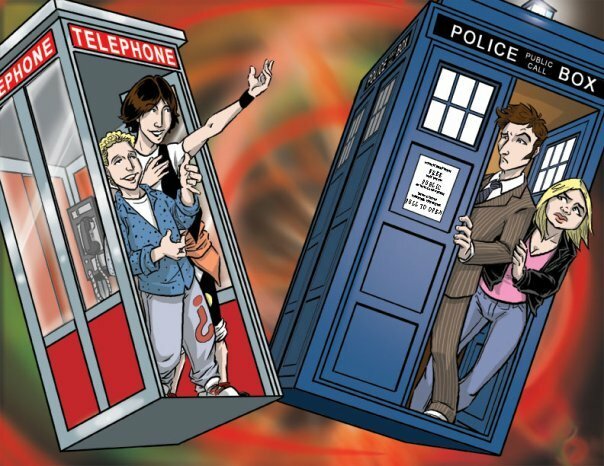 Before too long another telephone box appears with Bill and Ted's future selves inside. They convince their younger selves to trust Rufus who takes them on a short trip to 1805 where Napoleon was invading Austria. As they leave, an explosion causes Napoleon to fall into the wormhole the time machine creates and follows the trio to the present. Rufus leaves them with an empty booth and tells them to use it for their report. After Napoleon falls unconscious from a tree, they drag him inside and leave him with Ted's younger brother. 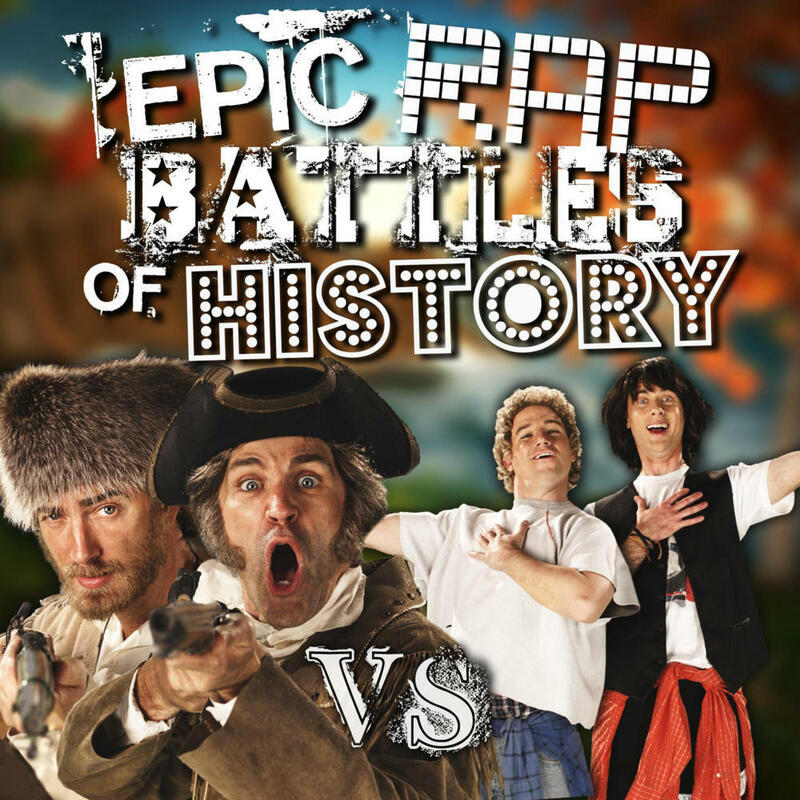 Bill and Ted decide to use the phone booth to go across all of history and pick up different people to take to their history final. The pair befriend Billy the Kid and Socrates (who they call So-cray-ts) before landing in medieval England. While here they see a couple of princesses and decide to find them in the castle. After several shenanigans later, they anger the king who sentences them to death. Billy and Socrates save them from the chopping block and they escape through time although with some damage to the phone booth. While this is happening in history, Ted's brother and his friends decide to ditch Napoleon leaving him to roam modern day San Dimas alone. Believing they have plenty of time before their presentation, Bill and Ted decide to pick up several other historical figures for extra credit including Sigmund Freud, Ludwig von Beethoven, Joan of Arc, Genghis Khan, and Abraham Lincoln. 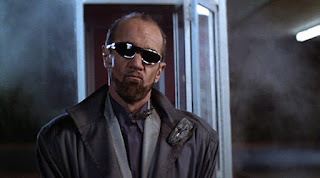 While traveling to get these individuals, Bill and Ted notice the damage done to the booth and make a pit-stop in prehistoric times to repair the time machine with some tin cans and bubble gum. It seems to work as the group lands outside the Circle K where they see their younger selves. Finally taking off and landing in the proper time they leave all the historical figured at the San Dimas Mall and go to find Napoleon who ended up at the water park, Waterloo. 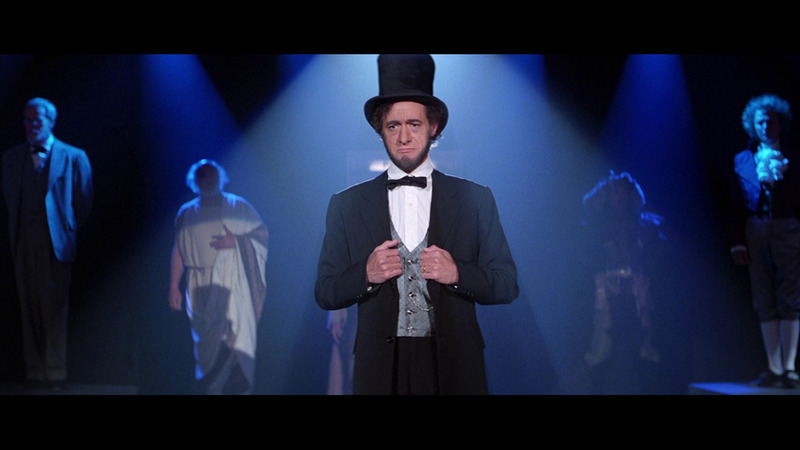 During Bill and Ted's absence, the historical figures end up causing havoc at the mall resulting in their arrest by Ted's father. Bill and Ted concoct a plan to rescue the historical figured from jail by use of the time machine. With their plan coming together they bust everyone out of jail and arrive in school with enough time to deliver their report at the last second which became a roaring success for all who witnessed it including Bill's Dad, Bill's Step-mom, and Ted's Father. In the end they send the historical figures back to their own time and talk about making Wyld Stallyns a reality by learning to actually play the guitar. Rufus appears having rescued the princesses and asks all four of them for their autograph as they are the four band members whose music changed the future into the utopia it has become. It's difficult to pinpoint exactly what makes this film work because there are several things that would normally make me annoyed or disinterested in a film that this one does...but yet it somehow works here. 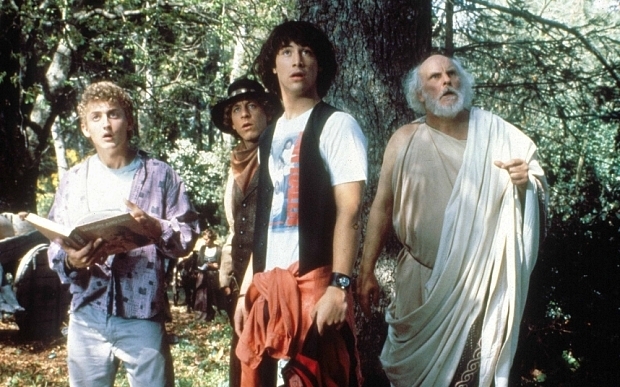 Bill and Ted's Excellent Adventure isn't just a movie it's more of an experience that you just have to try out for yourself because of how bizarre it can be at times. That said, I can still certainly pinpoint a few of the better qualities. Alex Winters and Keanu Reeves are excellent as Bill and Ted and they honestly make up for any of the shortcomings in this film. This is a good thing since we are following these characters throughout the movie. Any time I would find myself thinking "well that doesn't make sense" or "that's incredibly silly" I instantly forget any of those criticism because of an expression or some dialog that draw me back in to what's going on. Even if you don't enjoy this film, you would probably still agree that their performance is a major selling factor. Bill and Ted are just so incredibly dim witted yet they mean well and are honestly trying. It's so entertaining to watch them that I could probably just watch an hour of them goofing off in the garage attempting to play music and be entertained. There's also an attention to small detail. When they arrive in a new time period, even if it's only for a brief few moments, it feels like they have really appeared in that era. Everything from the costumes to the sets and props are authentic looking and give off an excellent atmosphere. Not only that but all the actors are going out of their way to do things in the background even if they aren't the focus. For example when Bill and Ted spot the princesses, Billy and Socrates could have just been standing there or could have just not been in the shot whatsoever, but instead they are throwing a football back and forth while staying in character just because they could. It's nice to have something interesting to look at no matter where you look on the screen. The story isn't overly complicated. It's not something that you have to really think about or concentrate on which can be a breath of fresh air in comparison to many of today's movies with overly complicated plots. 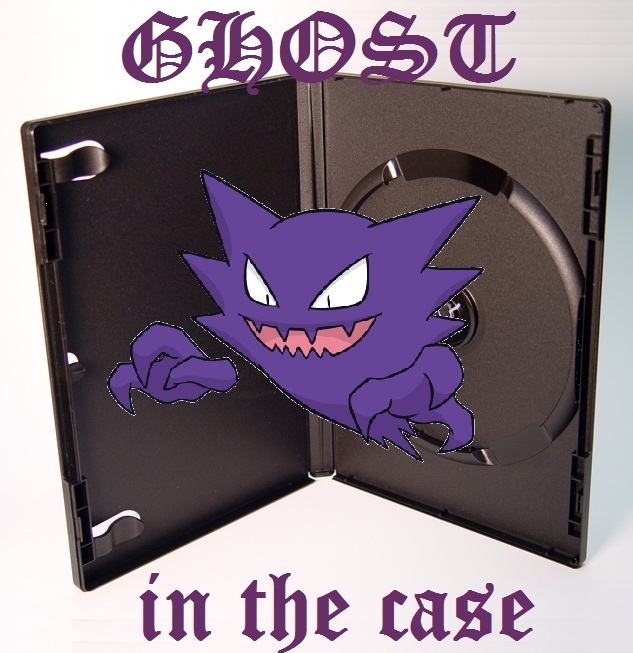 It's nice to sometimes just sit down and watch a funny silly movie. And yes this film is very silly but in a sort of lighthearted Tex Avery Cartoon kind of way that makes you laugh so long as you don't over-think it. That being said... it IS an incredibly silly movie. If you can't handle silliness then this may be a tough watch. A Utopian society brought by two idiots playing heavy metal and the whole society hinges on them passing history? They escape from the prison by a tape recorder and a trash can falling on Ted's dad? Beethoven gets arrested for simply playing a keyboard in the mall while Sigmund Freud gets arrested just for running around with Abe Lincoln? Bubble Gum and cans of chocolate can fix a futuristic time machine? A lot of this is incredibly silly so if you're looking for a movie with logic you might want to look elsewhere. One slight criticism could be the short amount of time they spend in parts of the past. This is kind of nitpicky I'll admit, but this is actually a criticism of the critics back when this film came out. Now, as a child I never saw this as a problem because I was focused on Bill and Ted but as an adult, I could see where people would want more. They spend less than ten minutes in the Old West and Ancient Greece. Freud, Beethoven, Joan of Arc, Genghis Khan, and Lincoln are all picked up within a two minute montage, and Napoleon only took about two minutes of screen time to acquire. They spend the longest amount of time in the medieval castle which most of that was Bill and Ted screwing around, having a Star Wars fighting scene and Bill thinking Ted had been killed. If you go in to this thinking you'll see a lot of history then you may want to think again. Lastly.. and this one kind of bothered me...the Timey Wimey was majorly off. As a massive Doctor Who fan and a fan of science fiction in general there are many aspects of time travel that have been observed and theorized over the years and this is one of the weaker entries from a time travel standpoint. They establish early on that time for them continues to flow so they can spend time in the past but in order to return to their own time and make it for the history report they only have a set number of hours. That's fine and all if you want to have a ticking clock and make a sort of barrier between periods of history... but later that gets chucked into the trash can by having them plan to do stuff for the police station sequence later that same day. Meaning they would do the history presentation, go back in time to set up the stuff that same day for them to be able to rescue the people and head to the presentation. Clearly there is the ability to move about through time in a single day in this world so why the ticking clock that they only had a few hours to nab people and get to the presentation? They're in a freaking time machine they could spend months tracking down people and just set the coordinates for the day and hour of the presentation and be fine. Makes no sense at all! This is not a movie that you necessarily need to bring your brain to. In fact it's probably better if you don't question things and just accept everything at face value like the film's leads. Over-thinking with this film could ruin your enjoyment. If you haven't watched this before then you should certainly do so as soon as possible. It's not one of the greatest movies I've ever seen in my life but it's good enough to fit on my "everyone needs to see this once" list. If you have seen this movie but it's been a few years I would suggest that you re-watch it because there were many things I caught with this latest viewing that I had never seen or fully understood as a child but now get/caught as an adult. It probably won't be your favorite movie but it's destined to be a most excellent adventure! Bill and Ted's Excellent Adventure is rated PG and is available on DVD and Netflix as of the writing of this post. You may even be able to find the whole thing on YouTube... I did!